Pench National park, nestling in the lower southern reaches of the satpuda hills is named after Pench river, meandering through the park from north to south. It is located on the southern boundary of Madhya Pradesh, bordering Maharashtra, in the districts of Seoni and Chhindwara. Pench National Park, comprising of 758 SQ Kms, out of which a core area of 299 sq km is the national park and and remaining 464 sq km is the buffer area. The area is especially famous for large herds of Gaur (Indian Bison), Cheetal, Sambar, Nilgai, Wild Dog andWild Pig. The key predator is the Tiger followed by Leopard, Wild Dog and Wolf. Other animals include Sloth Bear, Chousingha, Chinkara, Barking Deer, Jackal, Fox, Palm Civet, Small Indian Civet, Jungle Cat, Hyena, Porcupine etc. The forest is mixed and given the high rainfall precipitation one finds extensive stretches of Sal (Shorea robusta), a tree of moist deciduous forest in central and north India. The Sal is good quality timber, the leaves are good fodder, fruits have nutritional & medicinal value and is valued greatly by tribals. The other common tree species belong to the Terminalia genus, the most numerous being what in India is popularly known as Crocodile bark, the earlier Scientific name being Terminalia tomentosa, now it is referred to as Terminalia crenulata, it is good timber, locals call it as Saja and in Maharashtra it is called as Ain. Terminalia arjuna, locally called Arjun is distinct because of its pale bark and thick girth, is more common near water sources. The area is especially famous for large herds of Gaur (Indian Bison), Cheetal, Sambar, Nilgai, Wild Dog and Wild Pig. The key predator is the Tiger followed by Leopard, Wild Dog and Wolf. Other animals include Sloth Bear, Chousingha, Chinkara, Barking Deer, Jackal, Fox, Palm Civet, Small Indian Civet, Jungle Cat, Hyena, Porcupine etc. 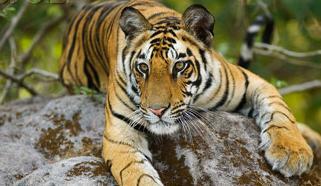 One can enjoy viewing the wildlife by two ways in Pench - Jeep Safari and Elephant Safari. A forest department guide is always their with the visitors on these jeep trips taken inside the park. 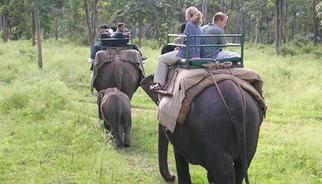 Elephant safari trips are organized for tiger tracking. There are over 285 species of resident and migratory birds including the Malabar Pied Hornbill, Indian Pitta, Osprey, Grey-headed Fishing Eagle, White-eyed Buzzard, etc. In winter thousands of migratory waterfowl including Brahmini Duck, Pochards, Barheaded Geese, Coots, etc visit the tanks and the Pench reservoir within the Park. Pench Tiger Reserve is also among the best areas for bird watching. Four species of the now endangered vultures white-rumped, longbilled, white scavenger and king vulture can be seen in good numbers in the Reserve. The other fauna present include 50 species of fishes, 10 amphibians, 30 reptiles, 45 butterflies, 54 moths and numerous other insects.